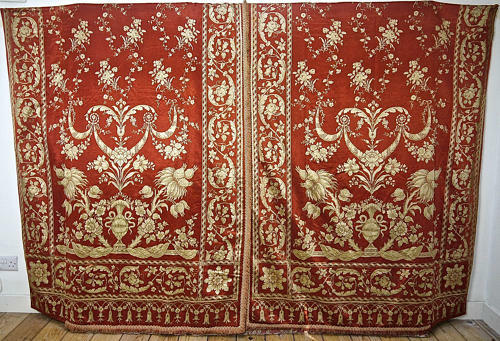 two pairs of stunning late 19th century french curtains of a sumptious dark coral with dull gold flowers printed silk.A large-scale design of a centered vase of exotic flowers with swags of roses above and bordered by climbing roses.trimmed with a cotton fringe and lined in cotton. Would work well as wall decoration as well as cyrtains. Some sun damage to several of the outside edges.Some minor marks on two of the panels.